URBANA, Ill. – Cassava is a staple in the diet of more than one billion people across 105 countries, yet this “orphaned crop” has received little attention compared to popular crops like corn and soybeans. While advances in breeding have helped cassava withstand pests and diseases, cassava yields no more today than it did in 1963. Corn yields, by comparison, have more than doubled. University of Illinois researchers analyzed four African cultivars to find out how breeding has impacted photosynthesis—the process that transforms light energy and carbon dioxide into yield. They found that unimproved landraces of cassava – cultivars that have not been bred for improvements like pest and disease resistance – are actually 20 percent better at photosynthesizing than their improved counterparts, as reported in Food and Energy Security. 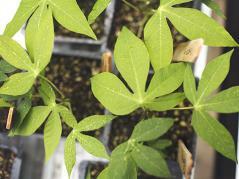 Data from this study is being incorporated into a computer model simulation of cassava, enabling the team to virtually tweak and manipulate photosynthesis “in silico” to determine what genetic changes will increase cassava’s photosynthetic efficiency and yield. The paper, “Toward Improving photosynthesis in cassava: characterizing photosynthetic limitations in four current African cultivars,” is available online [DOI 10.1002/fes3.130] or by request.